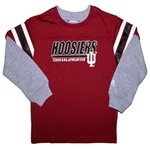 This stylish longsleeve tee from ADIDAS features a thermal insert for the sleeves and a great looking HOOSIERS graphic on the front. The ADIDAS logo is embroidered on one of the sleeves and the front graphic is nicely screenprinted. Great for cooler weather! The "fit" capri pants from Colosseum are made of a polyester material that is very comfortable and lightweight...perfect for working out. These are Colosseum's version of "performance" pants and the HOOSIERS logo down at the bottom of the left leg is nicely embroidered. As capri's they come down to the mid calf or so..just below the knees. 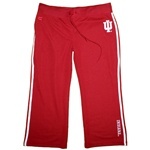 The waist has a drawstring and an IU logo in white near the hip. No pockets for added comfort and a slightly open bottom. Ladies sizes only. This classic looking golf polo shirt is made of a pima cotton blend and is nicely embroidered on the left chest with the interlocking "IU" logo. The tan color adds a nice change to your crimson IU wardrobe and the polo is Arnold Palmer brand, which is known for quality. 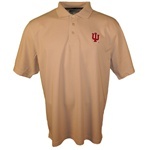 Though you may find similar polos in other stores, this one is made exclusively for Hoosier Team Store. Unisex (mens) sizing. This shirt is truly a work of art and while you may know of a tie dye artist with similar skills, we'll match ours up with anyone! The colors in this shirt and fine detail make this a wonderful way to show your Indiana spirit. 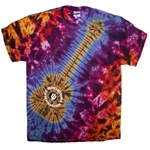 The front features a tie dyed guitar with vibrant colors and a simple white screenprint that reads "INDIANA BASKETBALL * LIVE! at ASSEMBLY HALL" in a 1960's style "Hendrix" font. The back of the shirt has a second screened logo that says IU ROCKS in "Butterfield" font...another 60's letter type. The fine detail in the shirt is achieved by using two to three times the average number of "ties" or rubber bands during the process of hand dyeing. These are preshrunk and have already been washed and dried several times to "fix" the dye. We recommend that you consider ordering one size larger than normal because of this. Truly a unique tee and one that can only be found at Hoosier Team Store! This unique shirt can only be found in our web store and features a soft fleece material (called "reverse fleece"). It is essentially a longsleeve lightweight sweatshirt with a collar and three buttons. The IU logo is nicely embroidered on the left chest. Classic and just a little dressy. 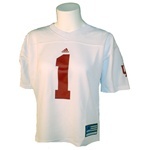 This great looking white replica fashion jersey from ADIDAS is nicely screened with the IU sleeve logos and the number one on front and back. It has an ADIDAS locker tag on the front bottom and is a V-neck style for comfort. The material is a mesh polyester and the sizing is for ladies only...smaller and ftted. On sale for $10 less than the original retail price! 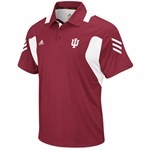 This awesome polo from ADIDAS is team issued and features moisture wicking material with a left chest "IU" logo. The white contrast side panel and accents make this very stylish and really a perfect one for golf as well. One of our finest golf shirts! 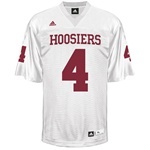 Here is an authentic replica on-field Indiana football jersey featuring #4 in white. The mesh construction and screenprinted logos make this perfect for games! 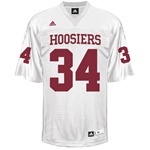 Here is an authentic replica on-field Indiana football jersey featuring #34 in white. The mesh construction and screenprinted logos make this perfect for games! 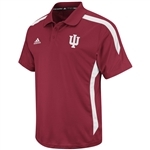 This amazing polo from ADIDAS is a team issued sideline shirt and features moisture wicking material with a left chest "IU" logo. The white contrast side panel and accents make this very stylish and really a perfect one for golf as well. One of our finest golf shirts! New for 2012, this awesome polo from ADIDAS is team issued and features ClimaLite material with a left chest "IU" logo. The white contrast shoulder and side panel and accents make this very stylish. INDIANA is embroidered vertically on back. 100% lightweight polyester. One of our finest golf shirts! The "campus" hoodie from Colosseum features a vintage look with distressed and slightly tattered applique INDIANA lettering across the front. 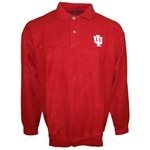 The IU logo is also applied and embroidered to the left shoulder sleeve. There are side pockets, a drawstring hood, and a full zipper front. Extremely comfortable and soft cotton...perfect for games and for cooler weather. Many people will wear this as a lightweight jacket. Unisex (mens) sizes. 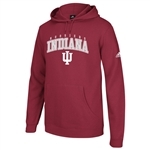 This stylish new Hooded sweatshirt from ADIDAS features tackle twill appliqued INDIANA with embroidered Hoosiers and IU logo. Perfect for watching games! Very comfortable 60/40 cotton/polyester blend fleece. Ribbed cuff and bottom hem. Unisex (men's) sizes and ADIDAS runs slightly larger than other brands. This superb new hooded full zip from Colosseum is a lightweight nine and a half ounces and is made as a training piece. 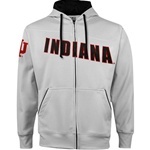 The material is a sleek and smooth moisture wicking polyester and it features sewn INDIANA lettering with the embroidered IU sewn on the side of the right sleeve. The hood is lined in contrast black and there are side pockets with contrast black piping. It has a zippered media pocket on the left sleeve that can hold a cell phone or mp3 player. Even the top of the hood has the word HOOSIERS embroidered on it. The drawstring is contrast black. This great new product is already selling very well and really is one of Colosseum's finest garments to date. Get yours now! Unisex (mens) sizes. 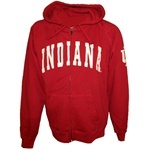 This is easily the softest sweatshirt of any kind on our website and it features sewn felt applique with the embroidered IU in the center. The drawstring hood and pouch pockets complete the look. The cotton/poly blend is "sueded" and this makes for the super soft feel! Unisex (mens) sizes.